In Douma, the operation to free the civilians and withdrawal of combatants continues. Thanks to negotiations between the Russian Reconciliation Center and the factions' leader, 56 hostages were freed. Over 3,600 fighters and their families have also left the city. There hasn't been any combat action for two days. Our special correspondent, Aleksandr Bilibov visited Douma. This is a unique footage of Russia's MOD's military police's Tigr (Tiger) armored vehicles. 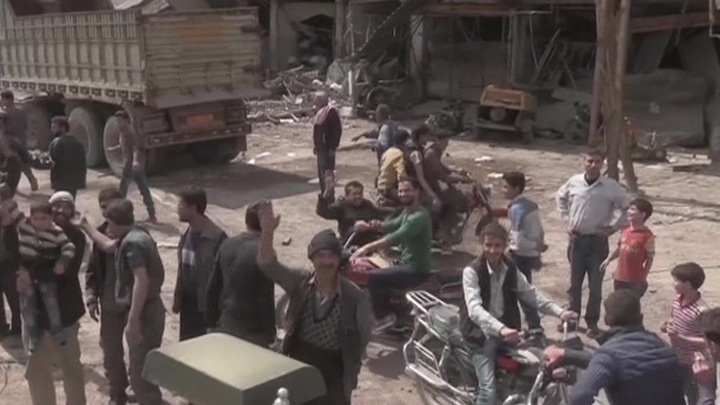 It's in Douma for the first time, even though not all of the terrorists have left yet. Locals are greeting our soldiers. The rebels' equipment is on fire everywhere: tanks, artillery and anti-aircraft mounts. The terrorists set them on fire themselves in order to not leave any trophies for the Syrian Army. You can hear shots being fired in the city. Rebels are only allowed to bring two magazines with them. They're firing into the air to get rid of the remaining ammo. This is the hospital that was allegedly under a chemical attack. It's located in the basement. Russian experts of radioactive, chemical, and bacterial protection have arrived here and now make their way inside, inspecting all of the rooms. They talk to the staff and to the patients. Aleksandr Rodionov, the head of radioactive, chemical and biological protection for Russian MOD: "During our inspection, we've determined that there haven't been any patients with sarin or chlorine poisoning admitted to the hospital. During patient exams, there were no signs of poisoning with nerve agents like sarin or chlorine." They didn't find any thousands, hundreds, dozens, or even one such victim in the hospital. Russian experts intend to thoroughly inspect the territory around the hospital and question the witnesses. All combatants are supposed to leave Douma within the next few days. The city is to be controlled by the Syrian army. Aleksandr Bilibov, Mikhail Vitkin, and Mikhail Emelin. From Douma, Eastern Ghouta, Syria.